After the events of 1965-6, progressive politics almost disappeared from Indonesia. Today, in a country with extreme and growing inequalities, people are increasingly concerned with the results of wild, unregulated capitalism. The current political scene does not seem to offer any valid alternatives. An entanglement of contradictions and a corrupt vocabulary do not help the construction of an alternative discourse. Giacomo Canetta, Contributor – Yogyakarta, Indonesia. Throughout 1965-6, Indonesia experienced one of its most pivotal – and ambiguous – historical moment. 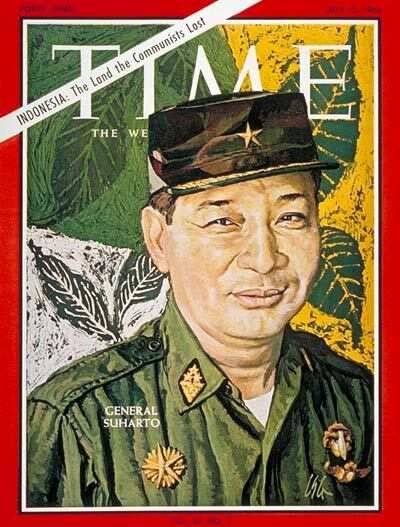 After an alleged and abortive coup d’etat on 30 September 1965, the Indonesian army staged a countercoup, took power, and – aided by various informal paramilitary groups – started a series of mass killings and detentions. Perhaps 500.000 people – mostly alleged members of the Indonesian Communist Party (PKI) held responsible for the aborted coup – were killed. Or maybe 1 million. Or maybe 2 millions, nobody really knows. The numbers are vague, but what is certain is that these events helped to install Suharto’s regime (which ruled until 1998) and wipe out any possible opposition in the country. The US aided in Suharto’s reactionary coup, supported the new military regime, and was relieved to have “saved” Indonesia from communism. In July 1966 Time celebrates and titles “INDONESIA: The Land the Communists Lost”. Reinforced by 31 years of authoritarian rule and ideological manipulation, the aftermath of these events is still relevant in the current political sphere. Even today, 20 years since democratization, restrictive anti-communist policies are still in place. But even more than legal regulations, it is the hegemonic narrative – as carefully constructed during Suharto’s regime – that effectively limits the political spectrum and dominates Indonesian political discourse. Not a single major party dares to identify itself as even slightly left wing. Often – when referring to ideas such as religious pluralism, accessible education, affordable healthcare and so on – the communist label is used to silence critical voices. And, most crucial of all, various (un)civil society groups constantly use thuggish methods to make sure that public order adheres to their ideals. At the same time, Indonesia is a country of extreme and growing inequalities. True, in the past few decades millions of people managed to rise above the international poverty line, but many to only find a new stable situation a few cents above it. With the dream of shared growth and enthusiasm for democratization quickly fading away, people turn critical of wild and unregulated capitalism. nonetheless, the current political debate doesn’t seem to focus on major social or economical issues. I discuss the matter with friends, Indonesian students interested in local politics. Students have played an important role in shaping the history of the modern world. And, Indonesia is no exception. Critical of authoritarian regimes and always at the forefront during the independence struggle – as well as during the reformasi movement: students have always been at the vanguard of social change in Indonesia. I sit with Lufi, a student from Medan, and we talk about current political issues. Our conversation keeps touching on how the government “doesn’t do enough” to help those who struggle to make a living. Lufi points at problems like corruption and unwillingness to act as root causes. Politicians are also deemed immoral and “not afraid enough of God”. It seems to me, however, that stressing the lack of government intervention indicates a problem in the economic system itself: capitalism is not able to satisfy the common Indonesian’s needs. Lufi agrees and we continue our conversation. Talking about the upcoming elections (in April 2019), the two major coalitions don’t seem to offer interesting alternatives. “Anyway, we cannot change anything. Because we don’t work there, in the offices where things are decided”. I remind him — and by extension, myself— of how politics exists outside of institutions too. Student activism, for example, played a critical role in Indonesian history, even when hindered by government repression. Left-wing activism in particular, is still stifled by the government and public opinion. But suddenly I am brought back to reality. “well, you know that here left-wing activism means PKI? And it’s just better if we don’t have any of that left-wing stuff anymore … You know what happened here!”. A certain version of history continues to exert its pressure on both the public sphere and people’s consciousness. At the same time, systemic criticisms are discarded – rather, questions concerning the moral integrity of government officials predominates the discourse. In search for a more structural analysis I meet with Daud, a political science student. Quickly, we touch on economic issues and the word “capitalism” finally pops out. Inequalities, difficulties in accessing higher education, the existence of an oligarchy … Daud has surely a grasp of what’s going on. But when we talk about upcoming elections I become uncertain. “I think both candidates are not bad. They just have a different approach to solve the problems of Indonesia”. I consider the two main candidates … Prabowo is known to be one of Indonesia’s most powerful oligarchs, while also Jokowi supports full swing market capitalism … “True, true. But that’s fine, as long as they focus on the welfare of the people. The capitalism that exists in Indonesia is not like in the US. Here crucial sectors of the economy are state-led”. I mull over this statement for a bit. But I am not really convinced. Honestly, how big of a role can the state still play in the Indonesian economy, in light of the continuing and ongoing market reforms? At the same time, in the case of Indonesia, the state’s presence tends more often to be of a predatory kind, rather than involved in the construction of a welfare state. Army? 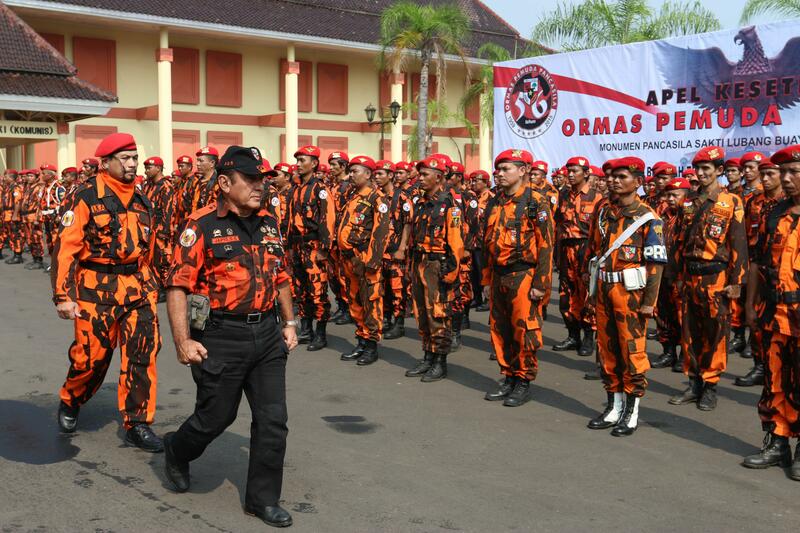 No, civil society at work: Pemuda Pancasila, the defenders of justice. All things considered, I keep finding it puzzling how critiques of the current economic system do not push people to look for a viable alternative. Attempts at creating different discourses are rarely met with enthusiasm, even by those unsatisfied with the status quo. Many students – usually the critical vanguard of Indonesia – seem to be complacent with the contradictions present in this economic and political order. But what is even worse, an informal repressive system constantly pushes critical voices underground. Groups of thugs acting with impunity, as well as a public sphere dominated by the obsessive fear of communism, are legacies of a precise historical period. The current political scene doesn’t seem to offer valid alternatives. An entanglement of contradictions and a corrupt vocabulary do not help the construction of a new discourse. It seems as though a specter is hindering the organization of any critical voice within the Indonesian political sphere. A specter is haunting Indonesia … the specter of anti-communism.